Lark Books (NC), 9781454709183, 128pp. 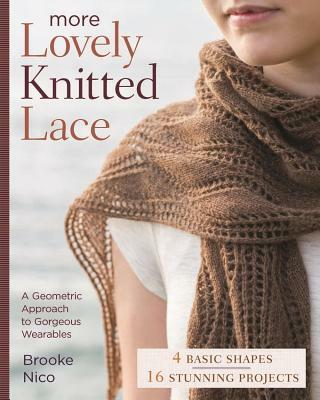 Brooke Nico, author of Lovely Knitted Lace and a nationally known lace teacher and designer, presents 16 new projects that offer a fresh and original take on lace knitting. Think sweaters, capelets, tunics and cowls, knit in yarns both thick and thin--contemporary designs that give knitters a wealth of new possibilities. Organized by overall shape--circle, square, triangle, and rectangle--these lovely garments will change the way you look at lace knitting. Step-by-step illustrations clearly explain any advanced techniques, while every pattern regardless of difficulty contains both written and charted instructions. Carrie Hoge, well known for her images for the Quince & Co yarn brand, contributes gorgeous and inspiring photos. Brooke Nico is the founder of Kirkwood Knittery, a full-service knitting store, which she runs with business partner Robyn Schrager. She travels to several festivals and fiber conferences annually to exhibit and teach lace-knitting classes, which are well known and often sold out. She promotes her books at national shows like Vogue Knitting Live, STITCHES, and The National Needlearts Association show, and her designs have been published in Sock Yarn Studio; One + One Scarves, Shawls, and Shrugs; and One + One Hats (all Lark). Find Brooke's designs online at kirkwoodknittery.com. She lives in Kirkwood, MO.